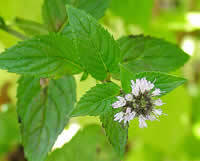 Peppermint (mentha piperita or mentha balsamea) is a hybrid mint, being a cross between watermint and spearmint. It is a perennial herb growing to 30-90 cm (12-35 inches) tall, and prefers a moist part-shaded location. It has purple flowers, and the leaves and stems are usually slightly hairy. Indigenous to Europe, it is now found throughout the world. It has been used as a medicine for thousands of years, with archaeologists finding evidence of its use ten thousand years ago. Peppermint oil is often used as tea and for flavouring toothpaste, ice cream, confectionery and chewing gum. It is also used in some shampoos, soaps and skin care products. Decongestant. The menthol in peppermint effectively clears congestion in the chest, throat, sinuses and wherever it is rubbed on the skin. Cooling in nature. Peppermint has a high menthol content. Menthol activates cold-sensitive receptors in the skin and mucosal tissues, so it has a cooling sensation when applied to the skin, and with some of its other uses. Pain relief. Relieves pain when rubbed on the skin. Radiation. Peppermint may protect from radiation in cancer treatment (1). Heartburn. A drop of peppermint essential oil in a small glass of water relaxes the gastro-esophageal sphincter, helping to promote belching. However, to cure heartburn see apple cider vinegar and the other acidic remedies on the Grow Youthful ailments and remedies page. Headache. Rub a few drops on the forehead or elsewhere on the head. Mental. Its refreshing nature provides relief from stress, anxiety, depression and mental exhaustion. It improves memory. Dental care. Prevents build up of germs in the mouth, and masking bad breath. Relieves toothache. Hair care. Cooling, cleaning, helps remove dandruff and lice. Skin Care. Nourishes dull skin and improves oily skin. Peppermint can be over-used, and it does not suit everyone. You just have to try it, and see how your particular body feels and reacts. Toxicity studies of the plant do not have clear results. Some authors report that peppermint may induce liver disease when taken in large doses for extended periods, but others found that it protects against liver damage that is caused by heavy metals. One of its toxic components is pulegone, which seems to vary considerably between peppermint cultivars. 1. Baliga, M. S., Rao, S. Radioprotective potential of mint: A brief review. 2010. J Cancer Res Ther. 6 (3): 255-262. 2. Moss, Mark; Hewitt, Steven; Moss, Lucy; Wesnes, Kieth. Modulation of cognitive performance and mood by aromas of peppermint and ylang-ylang. 2008. The International journal of neuroscience 118 (1): 59-77. 3. Cappello, G; Spezzaferro, M; Grossi, L; Manzoli, L; Marzio, L. Peppermint oil (Mintoil) in the treatment of irritable bowel syndrome: A prospective double blind placebo-controlled randomized trial 2007. Digestive and Liver Disease 39 (6): 530-6. 4. Merat, Shahin; Khalili, Shadi; Mostajabi, Pardise; Ghorbani, Anahita; Ansari, Reza; Malekzadeh, Reza. The effect of enteric-coated, delayed-release peppermint oil on irritable bowel syndrome. 2010. Digestive diseases and sciences 55 (5): 1385-90. 5. How Peppermint Helps to Relieve Irritable Bowel Syndrome. ScienceDaily. April 20, 2011.